Recruitment open for summer 2019 program! The 7th annual Mālama ʻĀina Field School at Nānākuli and Wai'anae will be held from June 17 - July 19, 2019 (M - F, 8 am - 2:30 pm). We are now recruiting students currently in grades 8 and 9 attending Nānākuli High & Intermediate School, Ka Waihona O Ka Na'auao Public Charter School, Kamaile Academy, Wai'anae Intermediate School, and Wai'anae High School. It will be another fantastic summer of enlightening education! Students who will attend Nānākuli High & Intermediate School and Wai'anae High School in 2019-2020 school year will be eligible to earn an elective credit upon successful completion of the program. Due to changes in school systems, recovery credits will not be awarded. There is a $75 program fee due after acceptance into the program. Scholarships are available for those with financial need. If you have any questions, please email info@malamalearningcenter.org or call (808) 305-8287. Student applications are available online and in paper form at participating schools (please see school counselors). A teacher/counselor/or VP reference is also required. Application deadline is April 26, 2019. Download forms (in Word) here. ​We're honored and elated to have helped launch the Mālama ʻĀina Field School, a summer school course for students residing in Nānākuli and Wai'anae. 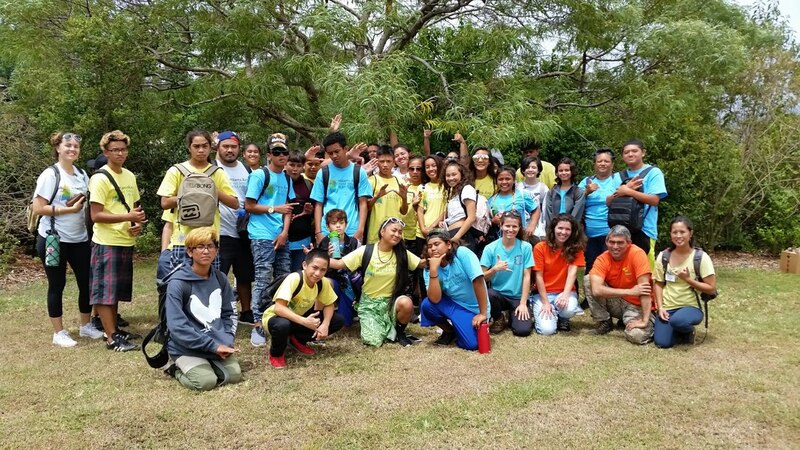 This course is an outgrowth of ideas that we and our partners in the Wai'anae Alliance for Wellness and Place-based Learning have discussed since 2012 to help the youth of Wai'anae succeed in school. Far too many get off track before they even reach high school. By providing a new type of program where classroom learning is directly tied to field work that incorporates math, science, and Hawaiian studies, perhaps more students will be motivated to attend classes and become college, career and community ready. The summer 2018 program marked our 6th year coordinating the program. With a team of talented teachers, we served students from Nānākuli High & Intermediate School, Ka Waihona O Ka Na'auao Public Charter School, Wai'anae Intermediate School, and Wai'anae High School. The Field School's curriculum provided students with content and hands-on experiences on understanding our environment, culture, and role as stewards of the land and sea. Upon completion of all program requirements, students earned credits in math, science, social studies, English, or an elective. And best of all, they had fun! That’s according to the nearly 40 students from grades 7-10 who completed the program this past summer! Please follow our student blog to see what these students along the Wai'anae coast accomplished together. Here's a fun, "unofficial" video of the 2018 program created by our summer intern, Jahnna-Marie Kahele-Madali! The Field School uses technology to make the classes virtually paperless by using Google Apps, Google classroom, and a unique website. This is not only good for the environment, it also prepares students for what will be the norm in classrooms of the future. We invite you to see the Field School website and the videos (see below) to get a taste of the Field School’s impact that we know will be far-reaching for years to come because the students and teachers involved in the program are destined to be our leaders. as well as our dozens of speakers and site hosts. MAHALO A NUI! This is a powerful program not just for students but also for teachers. For more information on the program and its curriculum, please contact Pauline Sato at pauline(at)malamalearningcenter.org. Here are video clips from our past programs. Celebrating the Future of Nānākuli with the Mālama ʻĀina Field School from Malama Learning Center on Vimeo. Exploring Kaʻala Farm with the Mālama ʻĀina Field School at Nānākuli, part 2 from Malama Learning Center on Vimeo. Exploring the Mālama ʻĀina Field School at Nānākuli, pt 1 from Malama Learning Center on Vimeo. Exploring the Mālama ʻĀina Field School at Nānākuli, pt 4 from Malama Learning Center on Vimeo. Exploring the Mālama ʻĀina Field School at Nānākuli, pt 6 from Malama Learning Center on Vimeo. ​The curriculum utilized existing resources as well as new lessons to promote critical thinking, problem-solving, teamwork, good learning habits, and an appreciation and respect for the land, sea, and cultural richness of Wai‘anae – and Nānākuli in particular. STEM education was integrated into the curriculum through tools used by professionals such as GPS (Global Positioning System) and GIS (Geographic Information System). As a final project, students worked on a “Nānākuli Community Atlas,” which compiled data and stories from the various areas studied including geology and soils, winds/rain, native and invasive ecosystems, cultural history, mele and ʻoli, and agricultural systems. This atlas was presented in forms such as maps and a brochure. In the summer of 2014, we coordinated the second "Field School" course at Nanakuli High & Intermediate School from June 6 - July 11. This time, we were able to expand the program to have two classes of students (incoming grade 8 and grades 9/10) taught by five amazing teachers and four UH West O'ahu interns who are prospective teachers. The curriculum was similar to the pilot program with some changes in site visits and speakers as well as classroom lessons, with a greater emphasis on math. Final projects for this course involved proposal to address the essential question of: How can we make the school a model of sustainability for the community? It was a completely enriching learning experience for students, teachers, and MLC staff. Students from both summers wrote blogs to chronicle the Field School's activities. Click on the links below to see the blogs. For more information about the Mālama ʻĀina Field School at Nānākuli, please contact us at info(at)malamalearningcenter.org.